Do you fancy a pair of DIY ripped jeans instead of spending a fortune on this year’s fashionable staple? Here are some step-by-step guides on how to make ripped jeans. There are plenty of advantages to making your own pair of ripped jeans, be they DIY ripped jean shorts or long jeans. You have absolute control over how you customize your pair of jeans. You don’t have to invest in a new pair as the best ripped jeans are those which already have that rough, distressed apparel. Upcycling your old wardrobe staples means less money invested in disposable items. Plus, it’s a great way to create less waste and help reduce pollution. Should we mention that you can brag about it on Instagram, Facebook, Pinterest, Snapchat, Twitter or any other social media channel of your choosing? Recreate this year’s favorite celebrities’ looks by donning a pair of DIY knee ripped jeans. Instead of paying hundreds of dollars for designer pairs, learn how to make ripped jeans. It’s worth every minute you spend in the process. A pair of jeans. We know you have plenty of jeans piled up in your wardrobe. Sharp tools. You can use scissors, a razor, or a sharp knife. The most important item on your DIY ripped jeans items list are the jeans. You wouldn’t want to slash and tear through a brand new pair of jeans for which you shelled out quite some cash. Look through your wardrobe for those old-time favorite skinny jeans, boyfriend jeans, high-rise jeans or jean shorts. Alternatively, scout the local second-hand shops or consignments for already worn jeans. They’re perfect to try out your ripped jeans DIY skills. Plus, it’s already worn jeans that have that slightly distressed look and the ideal washed out color to match the ripped apparel. Then, simply make some cuts across the fabric in any direction you want and throw them into the washing machine at maximum spin speed. Alternatively, you can try hand washing them – but be warned, distressing the rips in these jeans requires quite a bit of effort. A pair of jeans. Lend an old pair a new lease of life by turning them in the trendiest clothing staples of this year’s fashion. Sharp tools. Depending on the style you wish to imprint to your pair of do it yourself ripped jeans, you may want to use scissors, a razor or a sharp knife. Sewing kit. This item isn’t mandatory. Nonetheless, if you want to prevent the cuts in the fabric from getting larger, it’s a good idea to reinforce the margins. Chalk. You should outline the areas you want to cut out, slash or rip. Good old fashioned chalk is the best way to do it. First, analyze the cloth to make sure it doesn’t have any areas that have already been distressed since you will need to take them into account when you cut. Then, mark the areas you want to rip and/or distress. Put the jeans on and use the chalk to mark the areas while you’re wearing them. It’s key that you complete this step while standing. Even though DIY ripped jeans look rather rebellious, you don’t want those supposed knee holes to fall right above or right below the knee. If you are happy with the overall look, you can proceed to cut the pieces away and get rid of any extra pieces of thread. To create partially ripped jeans (that frayed patch you see in the image above) you can make 2 parallel horizontal cuts. Then, simply pull away the blue threads between these 2 cuts. A pair of jeans. We know you have plenty of jeans piled up in your wardrobe. Lend them a new lease of life by turning them in the trendiest clothing staples of this year’s fashion. Abrasive tools: sandpaper / a pumice stone / cheese grater / steel wool. Bleach. To further distress the jeans and make the fabric thinner. Now that you have the old pair of jeans prepped, get the party started. Just one teaspoon of bleach added in sufficient hot water to cover the jeans can make the fabric thinner. Plus, it helps with distressing the color. Set the temperature on your washing machine and dryer to be higher than usual. This step can also help you get that extra worn look for your jeans. Lay the jeans on the floor or a flat, sturdy surface. Make sure you’ve straightened every line. Add a carton on the inside to prevent cuts on the back side. Provided you don’t want your DIY ripped jeans to have symmetrical distress signs in the front and the back of the legs. Now, depending on the look you’re aiming for, use the sharp or the abrasive tools accordingly. The cheese grater, pumice stone, steel wool or sand paper are ideal for fringed looks or the perfect distressed patches. Each of these tools will yield a different type of worn-out effect. This is why it’s recommended that you test them on a piece of denim (maybe a pair of jeans you really don’t plan to wear anymore) beforehand. Expert tip: use tweezers to remove the blue threads in the denim material. That is if you’re going after the fringed look where the white threads are on display. If showing skin is what you’re after, cut, cut, cut. Review your work every now and then and adjust as you see fit. For easily riffed edges, use the razor around the edges of the cuts, pockets or on any other area. And this is the beauty of ripping your own jeans. You get to create a super cool clothing staple using a pair of jeans that fits you perfectly. Moreover, you get to decide for yourself if you want the gaping knee holes, the length slashes or the less attention drawing a fringed look. If you’ve embarked on this DIY project, we’re sure you already have a good idea on how to wear the DIY ripped jeans. Nonetheless, check out the lookbooks online. 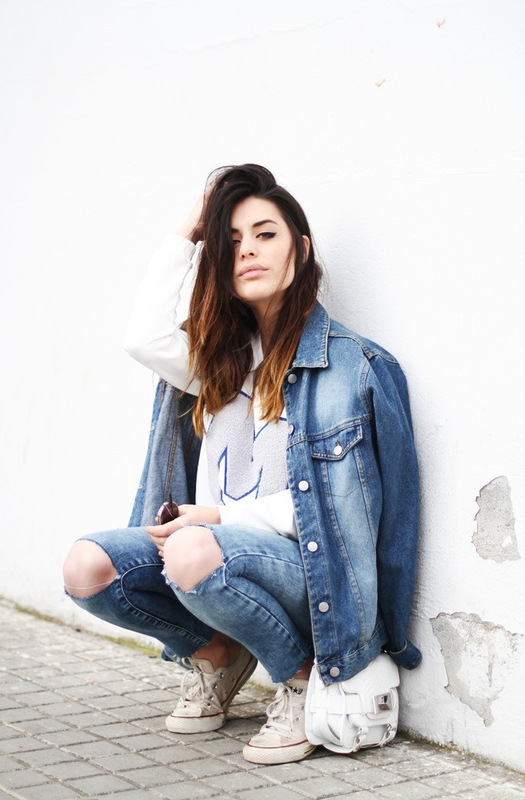 There are plenty of amazing ideas on how to wear ripped jeans in stylish, glam outfits or trashy, edgy ones. The only disadvantages we can think of when it comes to DIY ripped jeans is that you may not get it right the first time. Keep trying and perfect your technique. It’s still cheaper than forking out cash for a designer pair or a new pair of jeans that you’ll tear afterward. Enjoy! DIY Experience Copyright © 2019.